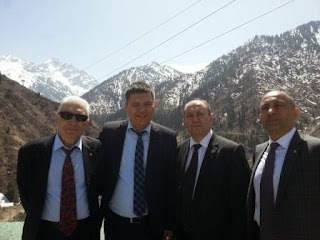 Professor Dr. Anton Caragea tour had started with Medeu ski resort. The Medeu ski rink was constructed in 1949, and the first competition took place at the stadium on the February 4th, 1951. To begin with it was naturally frozen by its location, but, to control its use, it now has a normal refrigerated. The statistics of the ring are really impressive. It is located on the eastern outskirts of Almaty at an altitude of 1,690 metres and has an area of 10.5 thousand square meters of ice. The altitude has made the ring the highest skating ring in the world. 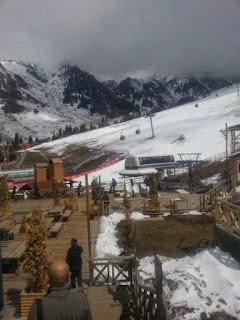 The Shymbulak Ski Resort is located 25 km outside Almaty city, in the Medeu Valley. There are three ski lifts at the resort with the highest going to 3200 meters above sea level. There is also a 4 star Hotel located at the Resort, enabling those wishing to ski during the day, have a place to stay at night. Shymbulak – this is a place that has something for everyone with a variety of routes, including the soft and gentle slopes for beginners and intermediates skiers and snowboarders as well longer trails for the experts., Shymbulak has a FIS downhill , wild valleys with untouched snow and terrain park for new-scholars, and special routes with moguls. Every year Shymbulak makes improvements to the trails. Shymbulak has 3,620 meters of certified trails by International Ski Federation (FIS). In addition, there are many off-piste lines for expert skiers and snowboarders. And if you have never stood on skis or a snowboard – it means it’s time to learn. Experienced instructors from our Snow School will gladly help you with equipment and teach you the skills to enjoy more of the mountain. You can learn all styles: freestyle, slopestyle, carving, or just a refresher to start your holiday right. Rentals of ski and snowboard are available along with locker facilities. .
Shymbulak is a place to relax, not only in winter, but also in summer! The beauty of the mountains is incomparable and must be seen and appreciated. At the foot of the wild and unexplored mountains are long valleys, which are covered with pine forests, amazingly beautiful meadows. And in the summer, camps for children are running. Development plans of expansion are planned within the complex, increasing the length of the cable car as well as other improvements to the slopes and trails.